Yeshivot Bnei Akiva Impacting Israeli Society-You Can Help! Mechinat Oz Shlomo in Mercaz Shapiro (formerly known as Mechinat Kiryat Malachi), founded in 2002 and named for the late Chief Rabbi Shlomo Goren zt"l, is a unique pre-army program that aims to assist students from challenging socio-economic backgrounds maximize their potential while preparing for their service in the IDF. 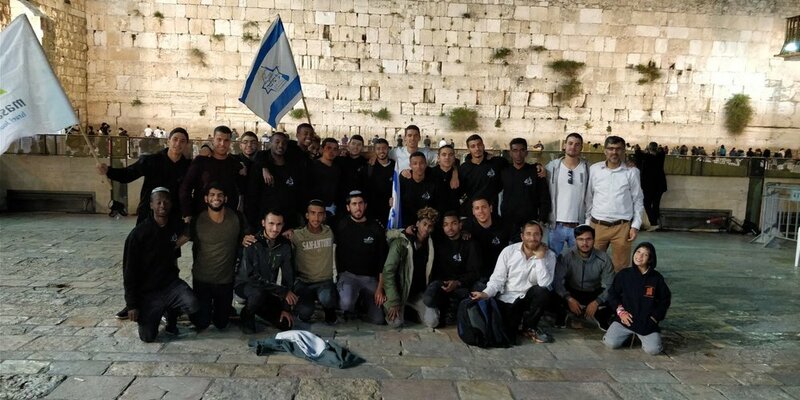 The educational program of the Mechina imbues students with Torah values, Religious-Zionist ideals and leadership training, along with lectures, trips and physical activities that get them ready to serve in elite combat units. For many of its students, the Mechina is not just "home away from home": It is their primary residence, and provides a support system that has given these young men something that they never expected: Opportunity to grow, and faith in their ability to do so. The hard work of the Mechina faculty is reflected in its alumni: 100% of alumni have served in the IDF, of who 41% have become officers. After their army service, 69% continue on to higher education and 20% continue in Yeshivot. Alumni and their families live throughout Israel and are active members of their communities. The Mechina is now embarking upon a project that will make its students feel truly at home: The dormitory will be expanded to be able to house 100 students, with bathrooms and showers adjacent to each room, additional classrooms, a security room on each floor, and other features that will allow its students to flourish, in an atmosphere that makes them feel comfortable and welcome. To help get the project off to a strong start, the Mechina has embarked upon a 3-day fundraising campaign with a dollar-to-dollar match, beginning Monday, 6/25/18. Please participate in the campaign by clicking the link below. In 2002, the Jewish community of Acco faced an existential dilemma: For the previous decades, thousands of Jewish families had moved out of the city. The Wolfson neighborhood was aging and its magnificent synagogue, once home to hundreds of vibrant worshipers, could barely put together a Minyan. The city known as "The Capital of the Galilee", once a vital entry-point to the Land of Israel, was in danger of losing its Jewish character. In the years since its founding, the Yeshiva, whose mission is to combine Torah study with Chesed and community service, has revolutionized the city of Acco, making the Jewish community proud and dynamic once again. Students of the Yeshiva spread throughout the city, teaching Torah to everyone, from youngest to oldest. They run enrichment activities in the local elementary school, evening shiurim for adults and after school activities for teens. Around the Jewish holidays the Yeshiva gathers residents of the city for Tefillot and cultural activities that deepen the communities understanding and celebration of the special days. Now the Yeshiva is looking to take its activities to a new height and create something brand new: A track of study for special needs individuals, which will include them as full members of the Yeshiva. As an institution that builds community, the Yeshiva understands that all members of the community must have the opportunity to learn Torah and be part of the ambitious projects in this crucial location. To help get the project off to a strong start, the Yeshiva has embarked upon a fundraising campaign with a dollar-to-dollar match, beginning Monday, 6/25/18. Please participate in the campaign by clicking the link below.